The first generation of financial planners rarely started out as financial planners; most were initially insurance agents or stockbrokers in the business of selling a product, who later evolved their business to get paid for advice instead (after they already learned how to sell). By contrast, financial planners entering the profession today often come to the table to be paid for their advice from the start, and subsequently struggle due to their lack of business development experience and sales skills. After all, the reality is that even if someone comes into financial services to be paid for their advice – not the products they sell – it is still necessary to learn how to sell in order to convince potential clients to pay for that advice. Yet unfortunately, relatively little exists in the way of sales training for financial advisors who actually want to be paid for their advice – historically (and still), most “sales training” was/is available from the product firms who train their “advisors” how to sell their products. Nonetheless, even if they must pursue it on their own, whether by reading, hiring a sales coach, or experience from the “school of hard knocks”, it’s crucial for today’s new advisors to recognize that selling – and developing their sales technique – is an essential skill for success. From being ready to “ask for the business” and “go for the close”, to crafting a sales process, managing a sales pipeline, and monitoring business development metrics – in the end, it doesn’t matter how great your advice actually is if you can’t convince anyone to pay you for that advice in the first place! Financial planning and the delivery of financial advice is at its core a helping profession. And like any profession, the primary role of the professional is in helping and serving the client. Yet the reality is that in a low-trust industry like financial services, a never-ending stream of clients to help don’t just walk in your door or call you up on the phone. And even if they do find their way to you, it’s hard for them to visualize what “financial planning” – an invisible, intangible service – is really going to do for them, and why it’s worth paying for. Which means if you want to help people as a financial advisor, you will have to find people to help and convince them that it’s worth paying for you for the cost of your financial advice services. In other words, even as a helping financial planning professional and a fiduciary, you still you have to sell your services. In point of fact, the reality is that the process of ‘selling’ doesn’t even end once the client comes on board. Ultimately, one can make the case that the entire purpose of financial planning is to help clients change their behavior in ways that will advance their financial future – which means the entire ongoing process of financial planning is one of continuously trying to persuade clients to do something different and “sell” them on why it will be beneficial to do so. Remember, if better financial planning outcomes were just about getting the information told to them, clients could look all this up online and do it themselves for free! Nonetheless, while the “selling” process may be continuous in working with clients to help them through their financial planning challenges, it’s still the up-front part of selling that remains most crucial; after all, it still doesn’t matter how good your financial advice is if you can’t convince anyone to pay you for it. It doesn’t matter how good your financial advice is, if you can’t convince anyone to pay for it! And unfortunately, there seems to be an emerging shortage of such sales skills in financial advisors today. While in the past, “advisors” were trained first and foremost to sell – because everyone started out as a product salesperson, and became a true advisor later! – in today’s world, people are increasingly becoming financial planners with the goal of delivering valuable advice and being paid for it from the start. Which means for a growing number of advisors, the lack of sales training or any experience in honing sales skills is becoming a serious blocking point in their career advancement. 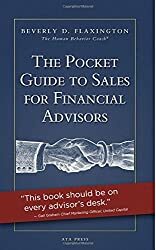 In her recent book “The Pocket Guide To Sales For Financial Advisors”, Beverly Flaxington makes the key point that the sales process itself is an engagement – a back-and-forth interaction between two people who are both trying to figure out if they should work together. But an important fundamental to understand is that from the perspective of selling and business development, the mere fact that you want to help clients – and that they may well need your help – isn’t enough. If you want the interaction to come to the desired conclusion – the prospect hires you and becomes a client! – you may have to prod the prospect along and show them the way. Unfortunately, going for the close and asking for someone’s business is difficult for many of us. We make ourselves vulnerable. We put ourselves on the line to potentially be rejected, and it feels scary to risk rejection (and even worse to actually be rejected!). And even if you’re confident it will go well, it can feel socially awkward or confrontational to put someone else (the prospect) on the spot to make that decision in the first place. Yet the reality is that financial planning is not a physical product they can pick up in their hands, test out for a little while, and then decide if they’re going to purchase it and take it home with them. Instead, it’s an intangible service that requires the prospect to trust and have confidence that the advisor will deliver that intangible value in the future. Which means it’s actually scary for the prospect, too. Financial planning is a difficult service to purchase. It’s always easier and ‘less risky’ for the prospect to keep with the status quo, do nothing, and not hire the advisor. In other words, while asking for a prospect’s business may feel scary to the advisor and wrought with uncertainty about the outcome, recognize that buying financial planning is equally or more scary to the prospect, and also wrought with uncertainty about the outcome from their perspective! And that’s why giving a prospective client a little extra ‘nudge’ forward is so crucial. Because the advisor’s confidence in asking for the business, the social tension that’s created by asking, is often what it takes for a prospect to make the leap of trust to hire the advisor in the first place. Or viewed another way, while it may be scary to ask for a prospective client’s business for fear of being rejected, you’re virtually certain never to get any business if you never ask for it at all. As Wayne Gretzky famously said, “You miss 100% of the shots you don’t take” – because prospective clients will virtually never volunteer to give the business to you. How many clients have you been unable to get because you simply never asked them to be a client in the first place? While it’s crucial to be ready to ask for a prospect’s business, going for the close is only part of the overall sales process. Asking someone to commit doing business in the first five minutes of the meeting would not only be pressured, but likely to get rejected – if only because the prospect hasn’t yet even had the opportunity to really understand what the advisor can do, and the value that he/she can provide. The starting point, then, is to create marketing materials that can be used help to tell the story of what the advisor does in the first place, and how the prospective client will benefit. In fact, Flaxington notes that a remarkably effective technique to accomplish this is to literally tell a story – either of another client, or even just a hypothetical one – that can illustrate how the advisor delivers services in a manner where the prospect can envision themselves in the story as the one who is benefitting. 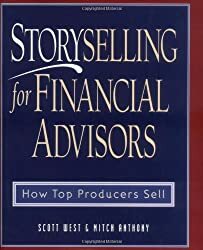 The approach is so effective that “Storyselling for Financial Advisors” by Scott West and Mitch Anthony, which was published 15 years ago, is still one of the most popular books on selling techniques for financial advisors! As a consistent selling process is established, the ability to make that ‘routine’ also allows the advisor to focus attention elsewhere – specifically, on improving the actual communication process with clients. For instance, some (prospective) clients may prefer to take in information visually, while others prefer to hear it. Some are more analytically driven and want the dollars-and-cents details, while others prefer to stay focused on the big picture. Some want to know what the advisor is going to do for them now, while others are more interested in the long term. The challenge of interacting with different personality types and communication styles is that when an advisor is so focused on just trying to learn a sales process and communicate anything, it’s very difficult to adapt the style of delivery to match the client’s preferences. Yet ultimately, the ability to adapt a communication style to match a client can drastically improve the ability to actually sell and get business done. The more standardized and consistent the sales process is, the easier it is to focus on (and improve) the communication and delivery next. At the most basic level, the business development process for an advisor is about turning strangers into prospects, and then turning those prospects into actual clients. The first transition is about prospecting and marketing – how do you reach the millions of people out there who are strangers to your business and turn them into someone at least potentially interested in doing business with you. The second transition is actually about selling – taking someone who’s potentially interested in doing business, and persuading them to actually hire you and commit to paying you for your services. Of course, you won’t really know which strangers are going to be prospects until they identify themselves as such. But once someone does become a prospect, he/she can be tracked in a “sales pipeline” that identifies everyone who is somewhere in the process between being a prospect and becoming a client. For firms that actively manage their sales process, the sales pipeline is an actual physical document (or at least a tracking spreadsheet or a report from the advisor’s CRM) that details the steps of the sales process (e.g., send initial marketing materials and information, schedule first approach meeting, conduct first meeting, schedule second/final approach meeting, conduct final meeting) and where each prospect is in the process. This ensures that with a high volume of potential clients, no one “slips through the cracks” and each prospect continues to be communicated with along the way. A sales pipeline report can also track the “quality” of each prospect. Is the person especially interested in doing business with you, or was he/she referred from a key Center of Influence that deserves a higher priority? Is the prospect known to be an especially large/affluent/valuable potential client who could bring in more revenue than the others? Prioritizing a sales pipeline further ensures that the highest quality prospects are treated as such. By tracking a sales pipeline on an ongoing basis, it also becomes feasible to craft metrics to track the entire business development process. What percentage of people who initially become prospects actually turn into clients? What percentage of prospects who initially contact the firm ultimately follow through to the first meeting? How many who do the first meeting sign up on the spot without the second meeting? How many go through both meetings but still don’t close? And when clients don’t close, why don’t they close? Did they say you were not a good match for their needs, that they chose to work with someone else instead, that you were too expensive, or is the reality they couldn’t even afford to pay your fee/minimums in the first place? By identifying and tracking the “Key Performance Indicator” (KPI) metrics of your sales pipeline and the business development process, it’s possible to identify potential problems and areas for improvement. If only 10% of your prospects turn into clients, it suggests that there’s a problem with your sales process. If the issue is that prospects take the first meeting but never follow through in the second, it’s time to look at exactly what’s being said in that meeting? If prospects are consistently going through all the meetings, but just don’t want to sign up, perhaps there’s a problem with the solution you’re offering or the way you’re explaining and “pitching” it. If you’re meeting with lots of prospects but they always choose other advisors, perhaps you’re not clearly differentiated enough. If you’re meeting with lots of clients who don’t think you’re a good match for services or who can’t afford to pay you, perhaps you’re not doing a good enough job qualifying that those prospects are a good match for your business in the first place. The bottom line, though, is simply this: while getting paid as a professional financial advisor may be primarily about helping people, you can’t survive as an advisor if you can’t persuade people to pay you for your services in the first place. And ultimately, refining your process and skills to be able to sell yourself effectively is as crucial as the refinement of any other business skills and process, and should be treated and managed accordingly! So what do you think? Is “selling” a challenge for you? Do you track and monitor and manage your sales process? Have you read any books that helped you figure out how to sell better? Have you ever used a sales coach to help you become more successful at sales and business development?